When you apply a filter in Photoshop Elements 11, you may be presented with a huge dialog box. This editing window is officially named Filter Gallery. You can also access it by choosing Filter→Filter Gallery. In the flexible Filter Gallery, you can apply multiple filters, delete them, and edit them to your heart’s content. This feature has made filters more flexible, more user-friendly, and easier to apply. Even when you’re using the Filter Gallery, make a backup copy of the image — or at least create a duplicate layer — before you apply filters. Filters change the pixels of an image permanently, and when you exit the Filter Gallery, you can’t remove the filters that you applied. In either Expert or Quick mode, choose Filter→Filter Gallery. The Filter Gallery dialog box appears. 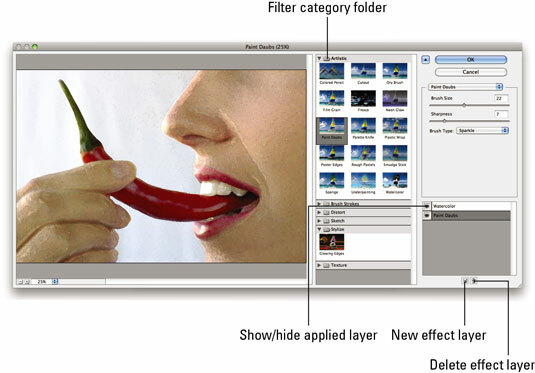 In the center of the editing window, click the folder for the desired filter category. The folder expands and displays the filters in that category. A thumbnail illustrating the filter’s effect accompanies each filter. To collapse the filter category folder, simply click the folder again. You see a large preview of your image in the left side of the dialog box. Use the magnification controls to zoom in and out of the preview. To preview a different filter, simply select that filter. In the rightmost section, specify any settings associated with the filter. The preview is updated accordingly. When you’re happy with the filter, click OK in the upper-right corner of the dialog box to apply the filter and exit; if you want to apply another filter, leave the dialog box open and proceed to Steps 6 through 8. If you want to apply another filter, click the New Effect Layer button at the bottom of the dialog box. Clicking this button duplicates the existing filter. Select a new filter, which then replaces the duplicate in the Applied Filters area of the dialog box. Elements lists each of the filters you apply to the image in the lower-right area of the dialog box. When you’re done, click OK to apply the second filter and exit the dialog box. You can apply as many filters as you want to your image. But often, less is more. Delete an applied filter: Select it in the list in the lower-right area of the dialog box and click the Delete Effect Layer button (the trash can icon) at the bottom of the dialog box. Edit an applied filter’s settings: Select it from the list and make any necessary changes. Click OK to reapply. Although you can edit a particular filter’s settings, that edit affects any subsequent filters you’ve added after applying that particular filter. Rearrange the order of the applied filters: Simply select and drag the filter up or down within the list. Rearranging the order of the filters you’re using changes the results of applying the filters. Resize the Filter Gallery dialog box: Drag the lower-right corner. Hide the Filter menu and provide the maximum real estate for the preview box: Click the arrow to the left of the OK button. Choose any of the filters found in the Filter Gallery from the Filter menu itself: Choosing a Filter menu filter launches the Filter Gallery automatically — but not all filters are available in the Filter Gallery. You have to access some of them individually from the Filter menu. Filters change the pixels of an image permanently, and after you apply one, you can’t remove it. Be sure that you truly like what you’ve done and that you have a backup copy of that precious family photo or critical project image.